Suitable for car and bike tyres this inflator is useful for quickly filling tyres on the go. Being small and light means you can always have one ready. It's also quite simple to use, just screw on the gas cartridge and push onto valve of tyre. The valve is control by a spring release - so can control the rate at which the gas comes out of the cartridge by pushing less/more firmly against the tyre rim. 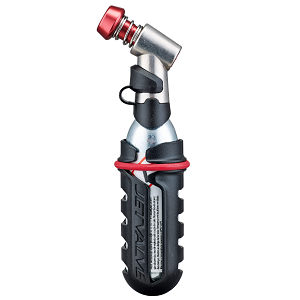 Screw threaded CO2 cartridges into the mini inflator/pump and push onto the tyre valve. For use with JetValve cartridges (16g-25g). Cartridge contains freezing liquid CO2 under very high pressure. Always take care to protect your hands and direct away from your body when in use. Uses Co2 which is non-flammable, non-toxic, no hydrocarbons or CFCs/HCFCs. Uses standard Threaded cartridges 16g and 25g. Can be used to inflate all bike tyres and even motor bikes, ATVs & quad bikes. Can inflate car tyres - but you'd need a dozen 16g cartridges! 1. Screw the cartridge clockwise into inflator and firmly hand-tighten. As the cap of the cartridge is pierced you will hear a rush of gas and a small amount may leak out. 2. DO NOT remove cartridge until empty. 3. PUSH the inflator onto the valve but do not press the inflator against the rim of the wheel until you are ready to inflate. 4. Once the inflator is located on the tyre valve press the inflator against the rim of the wheel - use the sprung release valve of the inflator to control the CO2 flow. 5. Cartridge contains freezing CO2 gas under pressure, so push onto the tyre gently at first! 6. If inflating a large tyre using multiple CO2 cartridges the tyre valve will start to freeze and could get damaged - so please allow the valve of your tyre and the inflator to unfreeze and warm up after dispensing each CO2 cartridge. 7. DO NOT dispense upside down - the inflator must be upright and directed away from your hand and body. 1. First gently push the inflator onto a tyre valve to check it is empty. 3. Cartridge may be freezing cold and also may still contain freezing high pressure liquid CO2.